Nike SB partnered up with Rob Heppler and Massachusetts boutique Concepts to design a special Dunk Low revolving around New England’s specialty, lobsters. Lobsters play a large role in the design process and are the nickname of the Dunk that consists of a sport red and pink clay colorway. In addition, the Nike Dunk SB Low Lobster came with a removable lobster claw band and a speckled design on the upper. The lobster references are found throughout the sneaker and are carried to the inside where a lobster bib sock liner and insole is seen. 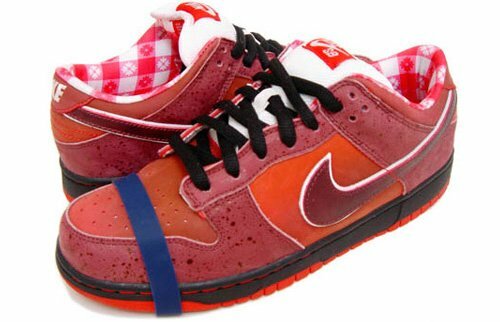 The Lobster SB Dunk Low was released in June 2008 exclusively at Concepts with only 250 pairs being created.